I haven’t written anything in a long time. Somehow everytime I tried, something else got in the way. Well, things happen, so this will be yet another story which already feels a bit old. 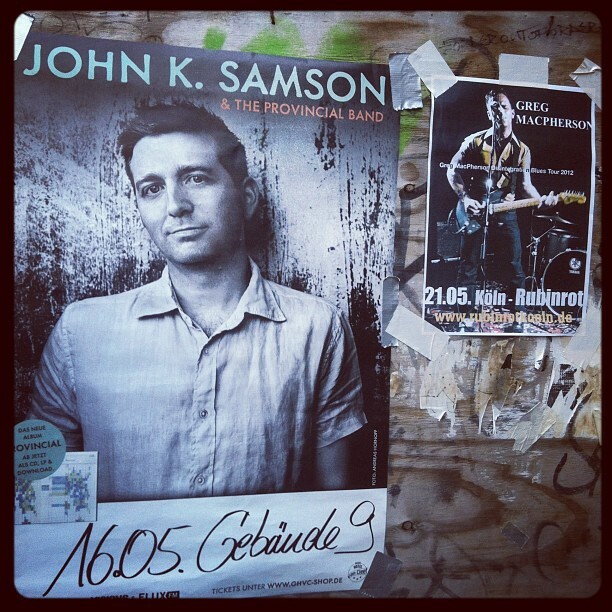 Way back in May the great John K. Samson (of The Weakerthans fame) came to Cologne to promote his new solo album. I had to check this one out, not only because I know John since I interviewed him in 1996 while he was still with Propaghandi. And to make things even better, a few days later fellow Canadian Greg McPherson came around for a visit. Which, as you can tell by the title of this post, were the Canadian Weeks in May. John released a few solo songs since he quit Propaghandi. The Slips and Tangles EP is still one of my favourite recordings, and although quite a few of those songs made it on Weakerthans records, I still like the raw and somewhat unfinished touch of the early mixes. Recently there have been two 7″ releases (1,2) which were pointing towards a full length record which came out a bit earlier this year. To be honest, John is and will be John, whether he’s the singer and mastermind of the Weakerthans or going solo. You can just tell by listening to his songs, that he has his own special way of writing music, his wonderful lyrics, which always are small depictions of everyday life, somehow introducing the listener to the life of another person for the span of a 3 minute rock song. So the music he’s playing on his solo recordings could have been released under the Weakerthans label and noone would have noticed. What’s more, although when you meet him off stage he can come across as rather shy, modest and reserved (which he isn’t, rest assured), on stage he seems to become a totally different person. His wonderful humour allows for a lot of laughs during a show, but he also knows how to tone down the pace every now and then. I skipped the support acts for some conversation with friends I hadn#t seen in a long time, but for 70 minutes or so of John’s set I was transfixed. A brilliant band supporting him, a nice mix of rock songs, old and new, some off the full length, some Weakerthans songs, even a Jawbreaker cover (“The Boat Dreams From The Hill”). He saved the bast for last though. For the encores he came out and asked the audience if there was any specific song they’d like to hear. Instantly titles were shouted at the stage, mostly old Weakerthans songs or “Slips and Tangles” tracks. And John responded. Although he openly admitted he wasn’t able to memorize a few songs, he still played “Anchorless” and a few more. A beautiful evening with great music. Just the way it should be. A few days later Mr McPherson played at a small club in Cologne, courtesy of a friend of mine, who had persuaded a few guys to set up the show (which was to be the last one of the tour). I am quite sure I had seen Greg play live a few years ago. A solo show at the same club. The first time I heard his name though was way back, maybe in 2000, when I was visiting a community on Yahoo which was all about the Weakerthans. There were a lot of people from Winnipeg contributing and I exchanged mixtapes with some of them. they were raving about this McPherson guy, but during the age of Napster it wasn’t easy to get a hold of his music. So I was very pleased to at least catch him on his last tour. His music isn’t as smooth and easy as John’s stuff, Greg has an edgier side to him. Although he’s usually alone on stage (on this particular evening he was accompanied by a drummer), he’s able to capture the attention of the audience by simply going all out. I guess, “intense” would be a great word to describe the experience. The music is raw and hard, but what almost instantly draws you in is his voice. Strong, distinct, proud, honest, yet affectionate, caring, passionate. One of the best voices in punk rock. Yes, punk rock. You don’t need a band and noise. What Greg’s putting up on stage is passion, honest passion. for almost 100 minutes he went all out on a sweaty, sticky, humid evening, in front of a crowd of about 40 people. And, I have to believe, everybody was glad they had dropped by. Greg told stories, communicated with the audience, was an all around nice guy and I can’t wait for him to come over to Europe again. Two great shows by two great musicians and great human beings. Sometimes life just makes sense.